I have been a long-time lurker, but this is my first ever project post! I made this mobil-type thing for my older boys room. 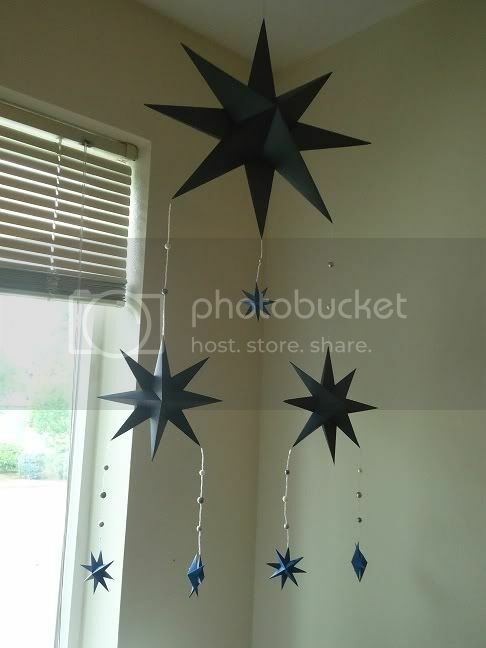 The large star is made with 12x12 inch scrapbook cardstock (pain in the but to get a sharp fold! ), the middle ones are made from 6x6 inch origami paper and the small ones are made from 2x2 inch. I think it needs streamers or something, but my boys like it as it is. This is lovely - they look VERY precise! Wow that looks great!! And looks like a lot of work! I really like this. I have been contemplating making something similar to hang over my dining room table for some time now. It's gorgeous; simplicity is stunning. I didn't even think of streamers when I saw the photo. Pretty. One who works with his hands is a labourer; with hands & head, a craftsman, with hands, head & heart; an artist.